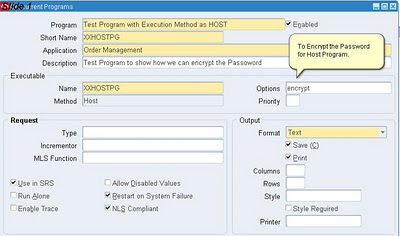 Applications and Integration Blog: How to Encrypt Password for Concurrent Program with Executable Mathod "HOST". How to Encrypt Password for Concurrent Program with Executable Mathod "HOST". This is a short Post about How to Encrypt Password while desiging the Concurrent Program with Executable Method "HOST". 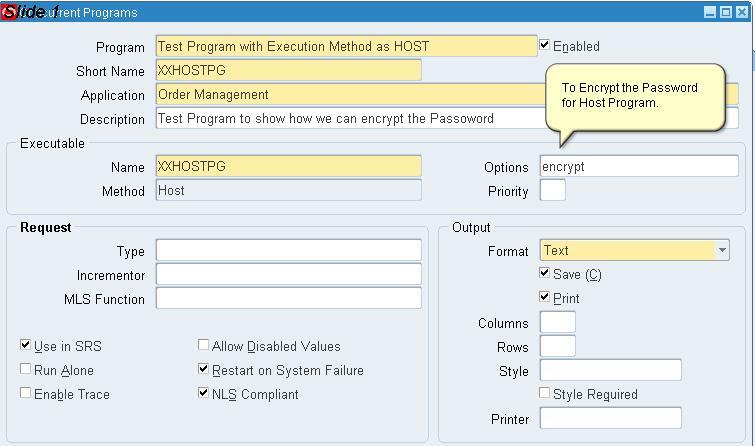 In the Concurrent Program Definition , when you Select a executable with a Method as "HOST" the Option text box will be Enable(read-write) as shown below Screen Shot , enter the value "encrypt" in that .Now if you run your Concurrent program the Password used in the Host Program will be encrypted automatically.